We love our pets and indulge them as if they were our children. Some of us even buy our beloved pet a birthday or Christmas present and we won’t hesitate to buy any item that we feel would add to our pet’s comfort or happiness. The end result of all this love is clutter. How much does your pet own? Do a quick inventory and you may be surprised. The typical dog, let’s call him ‘Fido’, may own several food and water bowls, a selection of snazzy collars and leads, a blanket, a basket and plenty of balls and rubber bones. In addition to this Fido may possess a whole array of medicinal items from special shampoo to keep his fur soft and fluffy, to flea powder to keep those annoying critters at bay, to worming powder to keep him healthy. Then there’s the food; tins of meat and bags of dried food all take up precious space in your home. Your Cat, let’s call him ‘Fluffy’, may have a similar array of possessions to Fido but will also need a cat carrier for those visits to the vet. Whilst kittens will need a scratching post if you want to save your furniture from harm, as well as a litter tray. Small pets are no exception to the rule. Rabbits, guinea pigs and hamsters require a cage, which will cost a lot more than the pet itself! They will also need food bowls, water bottles, blocks to grind their teeth on, grooming tools, special shampoo, outdoor runs, indoor runs, tunnels to play in, wheels to run on, and a pet carrier for visits to the vet. You will also have to find room for bags of woodshavings, hay and dried food for your little rodents. Fish will need a large aquarium, with an expensive filter, as well as food and various tools for scraping algae from the tank, so that you can actually see your scaly friends. If you feel the need to buy your pet a Christmas or birthday present then your list of pet possessions will grow. I’ve seen Christmas stockings for cats and dogs, special Christmas blankets, rubber chickens, chocolate treats and specially flavoured bones to tantalise Fido’s tastebuds. Your guinea pig can be treated to specially flavoured biscuits and little log cabins to sleep in as gifts, while fish can be given bridges and models of the Eiffel Tower to grace the bottom of their tank. The culmination of this buying frenzy is clutter. 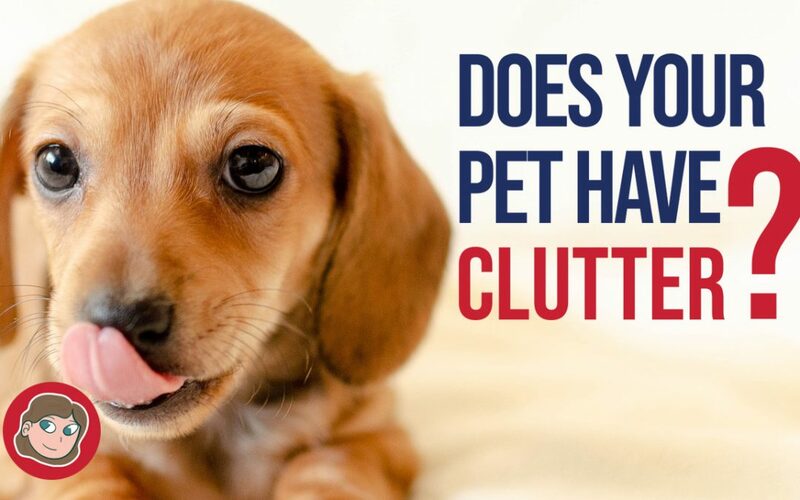 Your pet’s possessions will multiply if you aren’t careful, until your cupboards and utility room are full to overflowing with Fido and Fluffy’s possessions. The solution is to get out all, and I mean all of your pet’s possessions and lay them on the floor. Make two piles, those which get used and those which don’t. The items which don’t get used and this includes duplicates, could be given to a friend who has just acquired a pet, sold, or given to a charity shop. This will immediately free up precious space. But don’t fill up the space once you’ve got it. Pets, like children, appreciate time and attention more than material goods, so show you love your pet by cuddling it and looking after it, not by going on a spending spree.